Stirling Knights held on in a threatening comeback to conquer local rivals Sony Centre Fury to lift the SBC Playoff Finals title, 73-68 in a thrilling finish. The second game of the day was a highly anticipated game as it was the turn of the under 18 Men to battle it out for the Playoff Final title. This year saw an all Central final as Stirling Knights tipped off against Sony Centre Fury. The crowd were loud and proud for their respective boys. Knights got out to a quick 12-6 lead behind some accurate perimeter shooting from Ruari Doherty and David Paterson. This was set to be a physical game, all guards driving hard to the hoop and big men battling hard on the block, but it was Stirling Knights who commanded an early lead as they continued to keep it wet as they rained in consecutive 3’s. running out a 18-10 lead over Fury, a timeout was called with under 3 minutes remaining. Stirling were looking to have their hands all over the Playoff Finals trophy as they commanded a healthy 27-12 lead over Sony Centre Fury. Kieran Allan and Scott Lothian joined in on the triple party, this time however, hitting one each for Fury cutting the lead to 9, picking up the defence too they held Knights scoreless through the first 2 and a half minutes. Turnovers became an issue for Fury however as they were whistled out of their offence on consecutive possessions, causing a stalemate in the scoring. As a whole, the 2nd quarter was a 3 point shootout as 7 3’s were taken within the space of 3 minutes. A collapse for Fury resulted in a turnover and conceding an and-one which was followed by Coach Keith Bunyan calling time to sort his men out as they trailed by 13, 34-21. 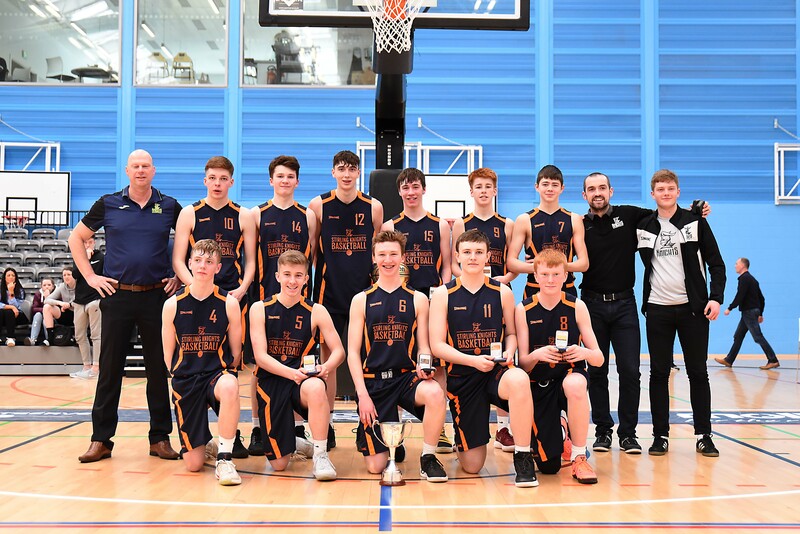 Stirling’s Dylan Johnstone was becoming a an issue that Fury would have to deal with, drawing fouls and grabbing rebounds, Fury assistant coach Ewan Carlow held his head in his hands in dismay. Things got ugly defensively for Fury as Stirling Knights forced a convincing 44-26 lead at half time. Stirling changed up the game plan for the 2nd half as they forced the ball inside to Lucas Hamill for easy buckets. Fury on the other hand were trying to play with a faster tempo and run the ball up the court and play near the basket, Bunyan’s coaching points paid off as his men were effective on the offensive end but still had chinks in the armour on defence. Both teams were running in transition, however, Stirling holding onto their dominant lead, 60-43. Young youth products Louis Sullivan and Rob Gilmour were putting in serious minutes in the 18’s, however, Fury had managed to cut the Stirling lead to 12 with 7 minutes remaining in the final quarter. Scott Lothian shifted the momentum towards his Fury side as he hit a 3 to cut the deficit to 7. Sardar Pandar from Fury decided to run the show as he went coast to coast for an uncontested layup, meanwhile Stirling couldn’t buy a basket as the game was 64-61. Fury had worked so hard, being down 20, they used the perimeter to tie the game up. Could anyone be Stirling’s knight in shining armour? Rob Gilmour stepped up big time as he raced down the floor, scored his layup and got fouled in the process, giving Knights a 3 point lead, before the freethrow, a timeout was called. The crowd was hyped. Gilmour missed the freethrow but Hamill secured the rebound allowing Doherty to get wide open for a shot, made, giving Knights the lead 71-66 with under a minute to go. Baskets were traded, with 18.5s left on the clock Coach Bunyan called his final timeout to draw up a game plan to try and rescue the Playoff title. Stirling Knights held on to defeat Sony Centre Fury 73-68 and were crowned the 2018 Playoff Champions. Dylan Johnstone was named Molten Sports MVP with an impressive stat line of 12 points and 20 rebounds.